Two fragments of a circular base of gray-blue marble. Located southwest of the temple of Apollo in 1937 (inv. Ε 344). 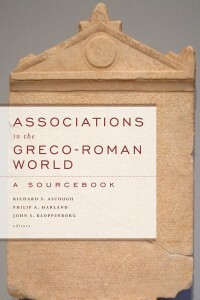 The honoree may be identified with the A. Terentius Varro who became governor of Asia in 78 or 77 BCE. (Latin) Italians and Greeks who are engaged in business (negotiantur) on Delos set this up for A. Terentius Varro son of Aulus, legate. (Greek) Italians and Greeks who are settled (katoikountes) . 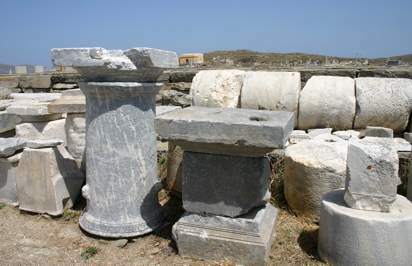 . . on Delos (?). . . set this up for Aulus Terentius Varro son of Aulus. . . legate (?). . . of the Romans. Photo © Claire Tuan 2012.